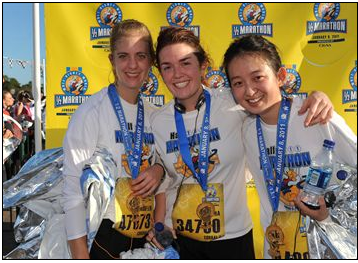 I’m running my second half marathon next Sunday in Boston! I attempted to follow an intermediate training plan, but this summer was too sweltering to run outdoors more than 3 days a week. That means for the other 3 or 4 days I cross-trained. Since outdoor activities were out of the question due to the aforementioned heat, I had two choices: pay for a gym membership or go it alone. I do enjoy gyms. I like being in a workout atmosphere. Making the effort to get to the gym ensures that I’ll actually (hopefully) complete a workout. But if I’m running 3 days a week outdoors, that rules out use of the treadmill; and I own a recline bike. So, I would essentially be paying for the weight room, and classes if I choose to shell out even more money. Alone it was. I decided to hit up Amazon for some workout DVDs and venture into the depths of my closet to find my old yoga DVDs. I feel like workout DVDs get a bad rap. I’m not sure if that’s the case, but in my head they are seen as monotonous and easy. I’m sure for some that may be the case, but the ones I use actually work you out. The first part of this series will focus on the yoga DVDs. Dear Rodney Yee, I would marry you just for your voice. It’s like a gentle wave crashing along a clear beach. My favorite video of his is Power Yoga. He teaches all three routines: flexibility, stamina, and strength. Each piece is around 20 minutes. I usually do one after dinner about four times a week. I never tire of them because his voice is so soothing, the Hawaiian location is beautiful, and the routines move at a great pace. You’re not in downward dog for 12 minutes. It flows allowing you to actually work up a bit of a sweat. The other DVD of his I would recommend is Upper Body, Abs, Lower Body. He teaches two of the three routines. These aren’t quite as all encompassing, but I find myself more eager to do all three at once should I have time for an hour long yoga session. All his videos offer great modifications for beginners, though I wouldn’t necessarily consider them beginner. Last, but not least, is the Skinnygirl Workout by Bethenny Frankel. I enjoy her humor on Bravo but was skeptical what her DVD would be like. She performs the yoga session along with a certified instructor. 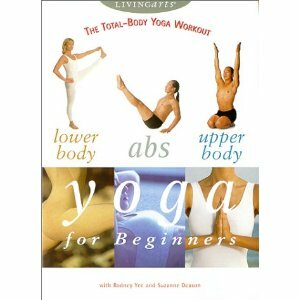 I’ve only had this DVD for a couple weeks, but the 40 minute routine reminds me a lot of Vinyasa classes I’ve been to in the past. I love the pose order. However, the idle chatter between Bethenny and the instructor will definitely get old after a while. I feel like learning the routine will be worth it but it could never replace my nightly Yee. Have you tried yoga DVDs? I know there are routines online too but I prefer following on a larger screen. Can’t wait to share my favorite circuit workouts in part two! B) my mom has been trying to get me to do Rodney Yee videos with her since June. Maybe I’ll actually do one now it has the Brenna stamp of approval. Do it! My mom loves him too. It’s also way more enjoyable doing yoga without the crazy headstand-chanting-people.